Atwood Mobile Products, LLC has been a world leading manufacturer of appliances and hardware for the RV industry for over 30 years. Definitive design and exceptional engineering help to separate Atwood from other manufacturers. Always striving for innovation and improvement, its no wonder Atwood Mobile Products, LLC has become an important part of the Recreation Vehicle industry. Atwood Water Heater 6 & 10 gal. Hot water is delivered in less than 30 minutes of reaching your destination with Atwood Water heater. All that is required is lighting the pilot light to begin the heating process, you'll have warm water in no time! Atwood water heaters weigh less than their competitors, 14 pounds less to be exact. Electric operating heaters can utilize a generator or an electrical hook up as a primary energy source making these heaters adaptable. Included features are problem preventing thermostat, pressure, and temperature relief valves and a high temperature limit switch. Select models can be operated within the coach by simply flipping a switch with the DSI feature. 10 gal models include a cold water inlet tube that is extended to allow heated water to last 55% longer. Remote operation switch with light indicators isn't included with Electric ignition models. Pilot Models require manual ignition. 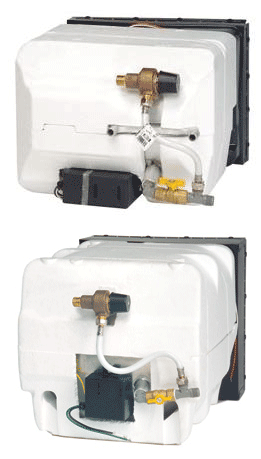 Electric Ignition prevents the water heater's pilot flame from going out. A heat exchanger is used to move heat energy from one place to another. For instance, heat from your RV motor to your water heater. It doesn't take a rocket scientist to know that this would be a money saving energy efficient feature..
DSI or Direct Spark Ignition allows you to light your water heater's pilot from within the comfort of your RV. Not only does this allow you to avoid adverse weather conditions but it requires very little effort, saving you time! 6 gallon Output: 8,800 BTUs. Cut-out size: 16"W x 12.5"H x 16.9"D.
Depth may vary between 16.9" and 18.5"
10 gallon Output: 10,000 BTUs Cut-out size: 15.5"H x 16"W x 21"D.
Atwood XT Water Heater, 6 & 10 gal. Don't let size fool you, The streamlined Atwood XT eliminates bulk and reduces size but provides MORE gallons of heated water than its actual capacity. The Atwood XT's intelligent design enables more heated water by mixing much hotter water with cool water via a pre-installed mixing valve attached to the rear. The result? 50% more heated water! Installation is easy since Atwood XT 6 and 10 gallon correspond with existing Atwood 6 and 10 gallon water heaters. 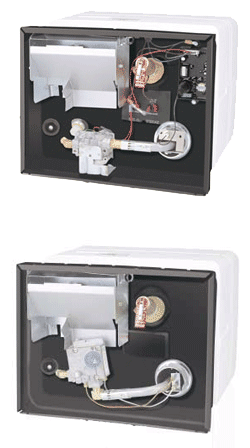 Meaning Atwood XT water heaters can fit in the same cut-out dimensions of existing Atwood 6 and 10 gallon water heaters. A featured winterizing by-pass kit comes installed to ensure freezing temperatures don't put an end to your hot water operation. Electric Ignition prevents pilot light outage. 6 gallon Cut-out size: 12-1/2"H x 16-1/2"W x 21-3/4"D.
Copyright © 2014 Atwood Water Heater. All rights reserved.